What Day Of The Week Is August 22? 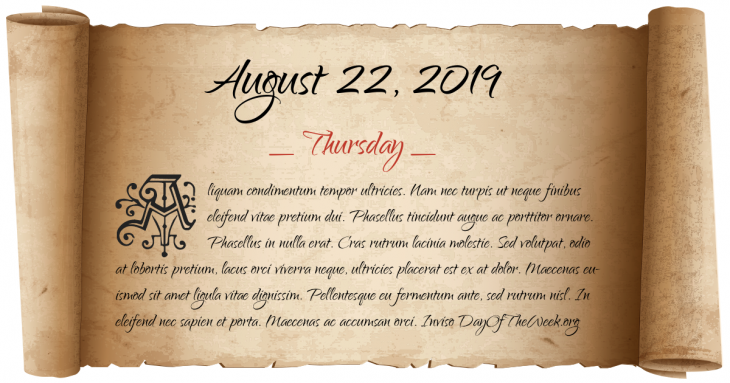 August 22, 2019 is the 234th day of the year 2019 in the Gregorian calendar. There are 131 days remaining until the end of the year. The day of the week is Thursday. French troops land in Kilcummin harbour, County Mayo, Ireland to aid Wolfe Tone’s United Irishmen’s Irish Rebellion. World War II: Brazil declares war on Germany and Italy. American Joe Walker in an X-15 test plane reaches an altitude of 106 km. Who were born on August 22?